Black and white photograph of bay mare, trotter Cleo Hanover wearing saddle number seven, E. Myers up for the 2.16 Class Trot at the Kite Track in Old Orchard Beach, Maine on Tuesday, July 9, 1940. The photograph is signed in the lower left corner by photographer Guy Kendall. 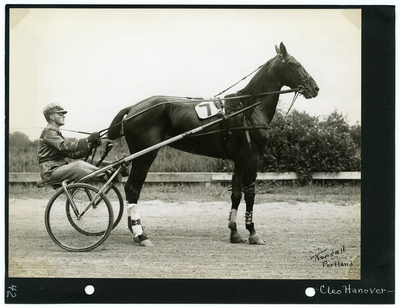 Cleo Hanover was out of the stabled owned by well-known philanthropist and businessman, Mahlon Haines (March 5, 1875 – October 31, 1962) out of York, Pennsylvania.